Inde pendent filmmaker Nathan Ives visited Dr. Frierson’s MFA thesis class this morning, teasing the class with the first fifteen minutes of his comedy, “It’s Not You, It’s Me.” Fortunately, students and other members of the public can see the film in its entirety tonight or tomorrow night at Geeksboro Coffeehouse and Cinema. Ives, an Asheville native, has lived in Los Angeles since the 1990s, writing screenplays and playing music. In 2011, he optioned a screenplay to Andrew Lauren Co. (The Squid and the Whale), and is now circulating his new film. He wrote, directed and produced “It’s Not You, It’s Me,” which stars Ross McCall, Joelle Carter, Vivica A. Fox and Beth Littleford. The film is branded “a serious relationship comedy,” and features the main characters battling their inner demons as they navigate the next step in their relationship. Those “demons” though, are not so scary when embodied by charming actors armed with engaging banter. Haute-Lifestyle calls it a “sleeper film with potential for a solid run.” Check it out, tonight or Tuesday. A program to be presented by Dr. Marsha Gordon and Skip Elsheimer will reflect the revolutionary spirit of the ‘70s through 16mm shorts. 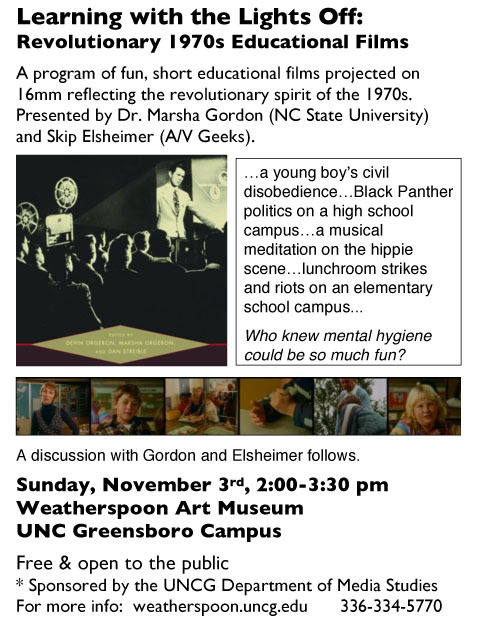 The films will screen on Sunday, November 3 at 2 p.m. at the Weatherspoon Art Museum on the UNCG campus. Skip Elsheimer (A/V Geeks in Raleigh) has a collection of over 25,000 ephemeral 16mm film prints, mostly educational “mental hygiene” films from the 50s, 60s, 70s. Dr. Marsha Gordon is a professor of film studies at NC State and is co-editor of Learning With the Lights Off: Educational Film in the United States. The screening will last about an hour followed by a discussion with Gordon and Elsheimer. A UNC media studies grad is writing interesting reviews of academic books for Slant Magazine. Back in 1999, David Rothley was an MFA student in the Creative Writing program at UNCG, when he decided to try his hand at screenwriting. He fell in love with the work and went on take three screenwriting classes at UNCG, studying with Professors Barr and Fragola. Rothley then headed out to LA to study screenwriting at USC, one of the top film schools in the world, where he earned his second MFA. After years of hard work trying to get a script produced, Rothley hit paydirt. He was asked to polish a script and ended up rewriting the screenplay for “The Million Dollar Date,” a feature film with a $3 million budget. The drama is in pre-production and will star Tom Sizemore, who played opposite Tom Hanks in “Saving Private Ryan.” Rothley has been hired by the independent production company to remain on the set as the film is shot this fall. Rothley is thrilled to watch his work being brought to life on set in Los Angeles, as well as on location in Texas and Miami.